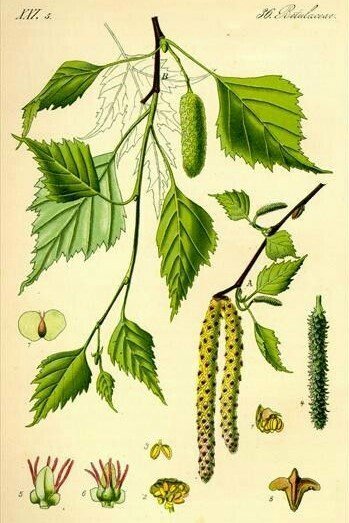 A deciduous species found throughout Europe, the Downy birch grows more commonly in wet soil such as peat bogs and clay. Mature Downy birch trees can reach up to 30m in height, forming a light canopy with elegant drooping branches. Its leaves are triangular in shape, the bark is grey-white with horizontal grooves all year round and its twigs are softly hairy to the touch. The tree is a pioneer species readily colonising cleared land, but later being replaced by taller, more long-lived species. Downy birch was among the first species of tree to be planted at our project in Ireland that is cleared exposed land, and with the aim to use the birch as a windbreak for our other tree species. In Celtic mythology, the birch symbolised renewal and purification. Bundles of birch twigs were used to drive out the spirits of the previous year, and gardeners still use the birch broom to ‘purify’ their gardens. It is also used as a symbol of love and fertility. In Scottish Highlands folklore, a barren cow herded with a birch stick would become fertile, and a pregnant cow would bear a healthy calf. Birch wood is tough and heavy, making it suitable for furniture, handles and toys. The inner bark is edible and it was ground up and used in bread-making in times of famine. The rising sap in spring can be used to make refreshing drinks, wines, ales and liqueurs and various parts of the tree have been used in herbal medicine.